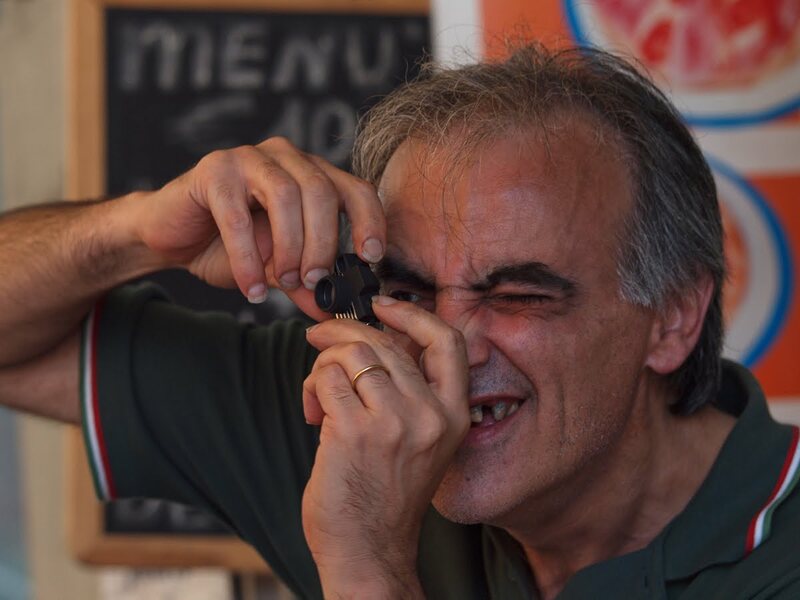 Menton Daily Photo: The Smallest Camera in the World? This series of photos in Ventimiglia (just across the Italian border from Menton) were taken when the wonderful Bob Crowe of Saint Louis Daily Photo was here with his lovely wife, Carolyn. 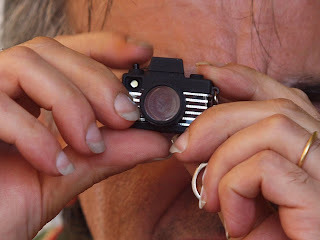 Readers of Bob's blog will already have met this man with his tiny toy camera - but for other readers, here he is. We had stopped for a much-needed cold drinks at the Bar Manhattan, near to Ventimiglia's covered market. I'm not sure if this man is the proprietor of the bar or not but perhaps his long and not very clean fingernails might indicate he is not. No matter - he was amusing. Cette série de photos a été prise à Vintimille (près de Menton, de l'autre côté de la frontière italienne ) lors du séjour ici du merveilleux Bob Crowe (Saint Louis Daily Photo) avec sa charmante épouse, Carolyn . Les lecteurs de blog de ​​Bob connaissent déjà cet homme et sa caméra -jouet - mais pour d'autres lecteurs , le voici . Nous nous étions arrêtés pour prendre un verre rafraîchissant bien nécessaire au Manhattan Bar , près de marché couvert de Ventimille . Je ne sais pas si cet homme est le propriétaire du bar ou non, mais peut-être que ses ongles longs et sales pourraient indiquer que ce n'est pas le cas. Peu importe , il était amusant. 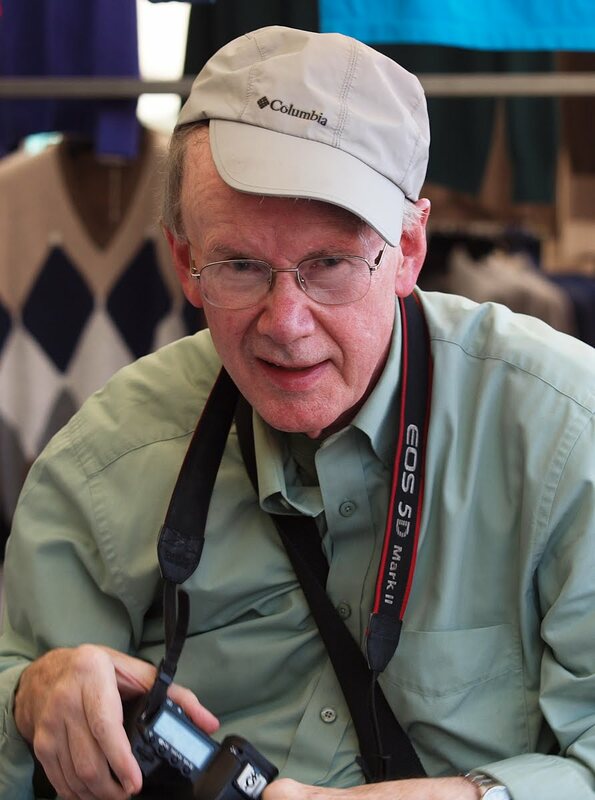 I remember Bob posting a photo of this guy with his mini-camera. I find it hard to think that this isn't a toy but with today's nano-technologies, who knows? Great way to have fun ! that wedding band suggests that someone else really appreciates his sense of humor. Another great portrait, bien sûr! Except for the squinting, a camera that size might help me get a shot in Aoki where they said "non"
Can't even comprehend how he would download or print anything from something that small, but would be mega interested to see some of his pictures if it's real. We got different views of this man even though we were standing next to one another. I didn't get anything like the close-up of his, um, camera. Nice close work. I wonder if he was playing to the stands and had a hat to send around afterwards?